The following information is from training done with Laura Romanik and my young Border Collie, Beckett. Visit Laura’s web site Radiant Competitive Obedience (http://lauraromanik.com/index.html), and feel free to contact Laura if you would like to schedule an in person or remote lesson, class or seminar. This drop is being done by my advanced dog with a UDX, Myst. Myst is very high drive and everything she does is fast as is her drop on recall. STEP 1: TEACH THE DOG TO DO A DOWN BEHIND A BAR FROM A STAND. I like to use the bar jump as the barrier for this work. Use a verbal command to ask for the down. May also use hand signal. Progressively add distance when you ask for the down until you are at a 40 feet distance. Work to only use the verbal command before you increase your distance. REMEMBER you should be teaching your dog that the RECALL TO YOU is the default behavior. The DROP is only when you ask for it, otherwise the dog should be coming in to you for the FRONT. Set your dog up behind a bar or barrier. Begin with 10 feet. Call the dog to you and ask him to drop approximately 2 dog lengths from the bar. This should put his drop should be behind the bar. Once the dog drops well at the distance of 10 feet from the bar and you are at 10 feet on the other side, slowly increase the distance of both you and the dog from the bar. For example, 12 feet to bar for dog; 12 feet to bar from where you stand. Repeat what you did in Step 2 but at a longer distance. Keep moving the distance of the dog to the bar and your distance to the bar until you are using the entire length of the ring. Add a second barrier and alternate between dropping the dog between each of the 2 barriers. 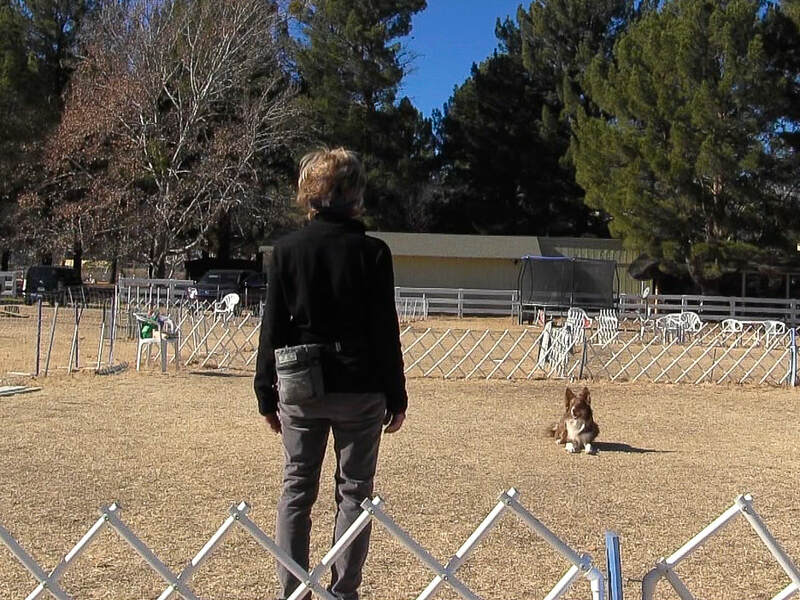 After your dog is dropping on the verbal command only behind the 2 barriers, add a 3rd barrier. Set the dog up at one end of the ring; you go to the other end and do a straight recall to front. Set the dog up again, you again go to the other end of the ring and call the dog to front but ask for the DROP. If he does this correctly without taking extra steps, use your verbal praise reward marker and go in and treat him. Dog will not drop on a verbal only. You have to use your hand and/or body to get dog to drop. Dog takes too many steps before dropping. Dog anticipates the drop. Anticipation of the drop can manifest in several ways: slow straight recall, change in pace of straight recall, dog dropping before being asked, stopping or other behaviors that indicate the dog is thinking about being asked to drop.